In response, some of the sport’s most popular drivers were asked their opinions about the flag, and their replies ranged from diplomatic to rather opinionated. 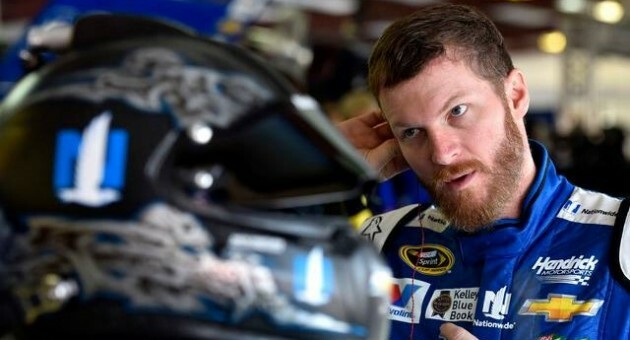 The strongest words, though, came from Gordon’s fellow Hendricks Motorsports teammate Dale Earnhardt Jr.
Earnhardt’s thoughts on the matter aren’t exactly a revelation—in his 2001 memoir, he recalled feeling uncomfortable when a fan asked him to give his opinion on the flag at a Q&A session in Richmond, Virginia. In the end, Earnhardt says he simply told the crowd, “I think it means something different to me than it does to y’all,” rather than try and debate the topic. Still, Earnhardt’s recent comments have sparked some outrage from NASCAR fans, with many suggesting that his late father would never have forsaken the stars and bars. However, that’s where they’re wrong. According to Yahoo Sports!, Earnhardt Sr. once bought one of those “American By Birth, Southern By the Grace of God” bumper stickers and slapped it on to the back of his pickup truck. But the sticker happened to include an image of the Confederate Flag, which his African-American housekeeper told him made her uncomfortable. Rather than defend the flag, Earnhardt sliced it off of the sticker and threw it away, leaving only the slogan. His son, fortunately, seems to have inherited his father’s good heart, in addition to his racing abilities.